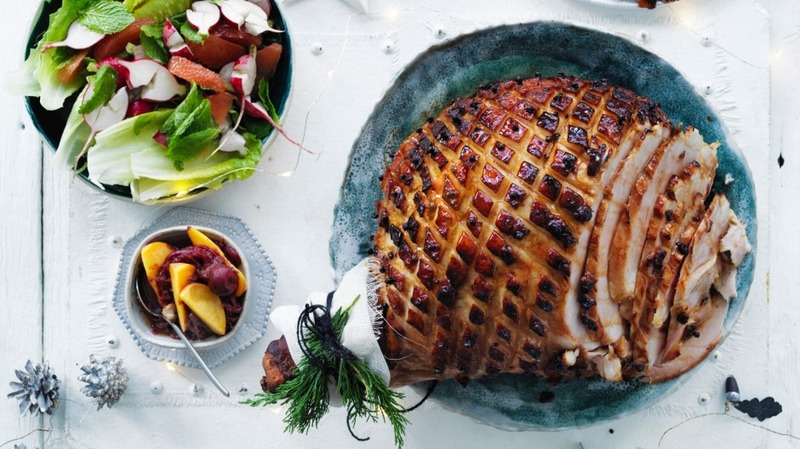 I usually serve my Christmas ham with a pickle of some kind, usually cherries, a pot of mustard and horseradish. 2. To make the glaze, place the stout, sugar, orange juice and peel in a saucepan and bring to a simmer. Lower the heat and reduce the mixture by half, or until it is lightly syrupy. 3. Using your fingers and the tip of a knife, carefully peel the skin from the ham, leaving as much of the fat underneath the skin intact as possible. With a sharp knife, lightly score the fat in a diamond pattern through the fat but not quite to the flesh and stud the centre of each diamond with cloves. 4. Line a heavy roasting tin with baking paper and place the ham in it along with 1 cup of water. Bake the ham for 20 minutes to warm it through before glazing. 5. Remove the ham from the oven and pat the glaze all over the ham with a pastry brush. Return the ham to the oven and bake for an hour, re-applying the glaze every 10-15 minutes, until the ham is a rich caramel colour.